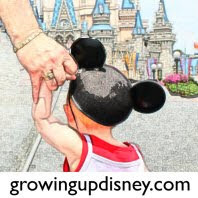 Today DisneyMom, DisneyDad, Audrey, and I are heading to Portobello for lunch and then will do a little shopping in Downtown Disney before heading to the room for naps. Chris is off exploring the Studios today alone. Tonight Chris and I will be attending Mickey's Not So Scary Halloween party. Chris and I ate our way around the world. I think he's going to post some pictures today. Our favorite marketplaces were Belgium, Ireland, and Singapore. We didn't try everything on the first day but we'll be back for more food and fun. The Baby Care Center came in handy for cleaning Audrey up after a very messy ice cream sundae. It was hot enough that the sundae was melting on the counter before the Cast Member could prepare the cone that completed the order. Audrey loved the playroom, so we spent a little time with their toys before heading back out into the park. We finished out the evening with dinner at Sunshine Seasons. Thanks for sharing our vacation and for all the well wishes! I am really enjoying the posts and making notes for our next trip!! !